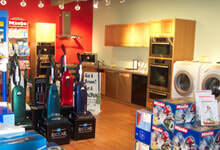 North Shore Vacuum and Appliance provides timely vacuum repairs Danvers MA area residents can rely on. Our shop is open six days a week, Monday-Saturday from 9 a.m. to 6 p.m. We offer free estimates on vacuum repairs, and free advice on our products and everything else. To schedule an appointment or speak to somebody over the phone about your vacuum repairs, Danvers area residents should call (978) 774-1155. A local shop for more than four generations, North Shore Vacuum and Appliance provides experienced vacuum repairs and has proved itself a lasting name in the industry. We offer vacuum repairs on virtually all major brands and styles of machine so that even if you didn't purchase your vacuum here, you can trust us get it fixed. For expert quality and timely vacuum repairs, Danvers MA area residents can count on our expertise.